As the Lent Madness global public knows, the Supreme Executive Committee is very concerned about the health and well-being of fans around the globe. In the next few days, a lot happens. Palm Sunday, the start of Holy Week, is coming right up. People in the US are facing down an April 15 deadline for tax filing. And your allergies might be going crazy with spring. That’s why we are giving away THREE mugs. You can use these for coffee or any other warm beverage, especially coffee (have we mentioned recently that the SEC is fueled by single-origin, fairly traded black coffee?). Rumor has it these mugs work equally well with tea, though scones are sold separately. 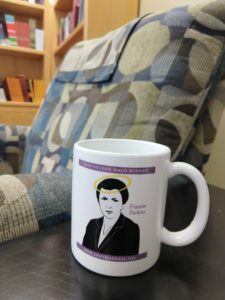 We have three Frances Perkins mugs available. As you’ll remember, Frances Perkins won the Golden Halo in 2013. She was a lay leader in the Episcopal Church and also served as Secretary of Labor from 1933 to 1945, the first woman to serve in the US Cabinet. These are literally the last three Frances Perkins Golden Halo mugs in existence and are major collector’s items in the world of Lent Madness tchotchkes. Here’s how you can win your free mug. Head over to the Facebook page of our sponsor, Forward Movement. In addition to the Lent Madness Facebook page, we hope you like the Forward Movement Facebook page. Anyway, once you get there, you’ll see a post from today (April 10) inviting you to like and share the post, along with a comment, story, or photo about your favorite saint. Do what that post says. Remember, like and share the Facebook post from the Forward Movement Facebook page to enter to win. We’ll pick three winners at random. You’ll have to give us your mailing address, and you get a mug. It’s that easy. Deadline is midnight EDT, April 15. We’ll announce the winner April 16. If you don’t respond within a day or so to our request for your address, we’ll pick another winner. Void where prohibited, must love Lent Madness to participate, etc., etc. P.S. Tim wrote a book about faith and coffee. We encourage you to read it. Maybe it will help you with ideas for using your new mug. And after you’re caffeinated, you can go for a nice, long walk in love. 24 Comments to "Win a FREE mug!" As an Atheist who is enjoying Lent Madness (and honestly taking it VERY seriously before casting my every vote), I feel I deserve a FREE mug in the spirit of inclusion. William, I love that you’re playing along with the Madness! Send along to afinke@forwardmovement.org. We’d love to hear about your favorite saint and will include you in the random drawing! And some of us gave up Facebook for life. So we can’t participate in such contests. Ever. Yes, Jane. Something I’m considering, as well. Bummer that some of us are excluded from the contest! If you are not on Facebook, send something about your favorite saint to afinke@forwardmovement.org and you will be included in the random drawing. Glad to have you participate! My praise of Lent Madness and Frances Perkins may be found at the L.M. Facebook site. OMG I want Frances Perkins! But I hate Mark Zuckerberg. What to do . . .
Just to let you know, Tim and Scott, that I have “liked” and “shared”! Oh and I love Lent Madness. So please “randomly” pick me. Go, St Guinefort! Too bad my chances of winning a free mug depends on joining Facebook. Nope. Send something about your favorite saint to afinke@forwardmovement.org, and your name will be included in the random drawing. We’d love to have you participate! Why Facebook and not Twitter? I’m still made about Cambridge Analytical. I want to know which friend caused my data to be exposed. If you send us something about your favorite saint, we’ll include you in the random drawing. Send to afinke@forwardmovement.org. Happy to have you participate! I would hands down choose St. Anthony as I forever lose thing she and he has NEVER failed me. I only use him for the big stuff so he can assist others’ more urgent requests. Each day I wake up, grab my phone as I am looking out of one eye and get on to read about each saint and vote! Love learning about each and I have a favorite one each day which makes them all my favorites. Voting is hard but I vote for the one I relate too the most. Pleased to discover that although my shattered 2016 Dietrich Bonhoeffer Golden Halo coffee mug is (was) irreplaceable, the Bonhoeffer pint glasses are still on offer over at Forward Movement. Get ’em while they’re hot, people! Very important to have a beer glass to cry into if none of your saints win. Tears mostly just fall around beers in long-neck bottles or cans. Very messy. Perhaps a chance to win a mug from a secret last stash of another Golden Halo winner for those of us who have not yet given up on resisting FB’s ferocious gravitational pull into utter, outer darkness? Oh, never mind. Thank you, Alyssa! This is my first time playing Lenten Madness. We’re sharing the posts in our EfM group, and having lots of fun in the process! Your posts are a perfect supplement to our textbooks and RRG. I could conduct a Theological Reflection or Taizé Service using such a fine mug! I would take good care of it.